Located in between Lot 10 and Fahrenheit along Kuala Lumpur's Golden Triangle on Bukit Bintang is Ansa Kuala Lumpur. Everything is within easy walking distance - only approximately 100 metres walk to the monorail, the hop on and hop off bus stop is located right outside and so many dining and shopping outlets to choose from. This is an excellent accommodation choice for those wanting to explore Kuala Lumpur's city centre. A popular choice for business and leisure travellers, enjoy oversized rooms with modern amenities, floor to ceiling windows with fantastic views of the city skyline and hotel swimming pool. Berjaya Times Square Hotel boasts a convenient location in the heart of the city with access to public transport, attractions, entertainment, restaurants & much more. Families are also well suited to this Kuala Lumpur accommodation with larger rooms available plus a children's playground. A popular choice for business and leisure travellers alike, the Dorsett Kuala Lumpur sits within the heart of Kuala Lumpur`s Golden Triangle with the convenience of shopping, dining and local attractions nearby. This Kuala Lumpur accommodation features modern rooms and great hotel facilities such as a swimming pool, gym, cafe, bar and restaurant. The Petronas Twin Towers are also within walking distance from the hotel through an air conditioned link bridge. 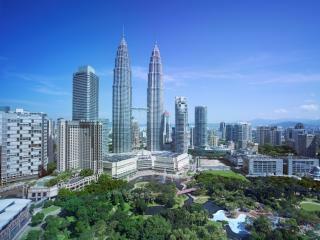 Explore the best of Kuala Lumpur from this comfortable base at the Dorsett Kuala Lumpur. E&O Residences are in a fantastic location to discover Kuala Lumpur and it's landmarks. Situated in the central business district the 1 and 2 bedroom suites are luxurious provide guests with a home away from home as they discover the modern and busy metropolis of Kuala Lumpur. Offering stylish accommodation in the heart of bustling Kuala Lumpur, Hotel Istana Kuala Lumpur City Center is home to an outstanding range of onsite facilities and an impeccable range of accommodation including rooms and suites offering Club Lounge privileges surrounded by Pavilion Shopping Mall, Lot 10 Shopping Centre, Changkat Bukit Bintang, the Petronas Twin Towers and the Kuala Lumpur Convention Centre. Offering luxury accommodation next to the iconic Petronas Twin Towers, Hotel Maya Kuala Lumpur features 5-star rooms and suites in the heart of the city. Boasting an elegant and contemporary range of comforts, the hotel enjoys an impressive range of onsite facilities and mesmerizing views of the KL city skyline. Close to a range of shopping and dining options, the hotel is just minutes from popular attractions. If you are looking for a hotel in Kuala Lumpur that is close to the Golden Triangle, the Kuala Lumpur Convention Centreand the Bukit Bintang Shopping District plus many other tourist attractions then Hotel Novotel Kuala Lumpur City Centre is the perfect choice. This Kuala Lumpur accommodation features a number of facilities to ensure a comfortable and convenient stay including restaurants and bars, an outdoor swimming pool and free WiFi. Located in Kuala Lumpur's city centre within walking distance to the Petronas Twin Towers, shopping and dining. The InterContinental Kuala Lumpur is an excellent accommodation choice for all travellers wanting to enjoy Kuala Lumpur sights and the comforts and facilities within this excellent hotel. If you are planning on heading to Malaysia to visit Kuala Lumpur and are looking for accommodation that is close to shopping, attractions, transport and the business centre, then why not stay at a luxury 5-star hotel. Le Meridien Kuala Lumpur offers a variety of facilities for both business and recreational purposes plus offers easy access to Kuala Lumpur International Airport on the express rail service. Located directly adjacent to the Petronas Twin Towers and the Kuala Lumpur City Centre Park, the Mandarin Oriental, Kuala Lumpur offers one of the best locations and views in the city. For those who are in town for business or for a holiday, this Kuala Lumpur accommodation features luxury five star rooms with a large range of recreational and business facilities. 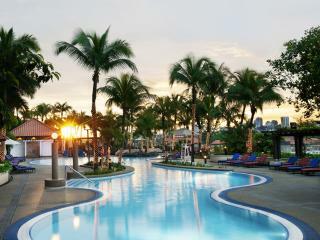 Everything that you need to enjoy a relaxing and memorable Kuala Lumpur trip can be found here. Located in the city's exciting Golden Triangle precinct, Pullman Kuala Lumpur City Centre Hotel & Residences offers 5 star accommodation surrounded by some of the region's most popular shopping, dining and attractions. Offering all the modern comforts, the hotel is just a short stroll from the famous Petronas Twin Towers, Embassy Row, the Convention Centre, Bintang Walk, Shopping Malls, Jalan Tun Razak and Bukit Bintang. Set in the heart of Kuala Lumpur's Golden Triangle the Renaissance Kuala Lumpur Hotel is an ideal choice for business and leisure travellers. This Kuala Lumpur accommodation boasts luxury five star facilities and amenities. Spend time at the large variety of shops which are within easy access from the hotel or visit some of the tourist attractions such as the Petronas Twin Towers. This Kuala Lumpur accommodation is the ideal choice for those who are in transit, require a stopover or on an early morning or late night flight out of Kuala Lumpur International Airport in Malaysia. Sama-Sama Hotel boasts a large number of facilities including restaurants, a bar, recreational facilities such as an outdoor swimming pool, tennis court and gym all within an easy 5 minute walk from the airport. The well-appointed and comfortable rooms at the Shangri-La Hotel Kuala Lumpur are ideal for business and leisure travellers. Within walking distance of this Kuala Lumpur accommodation is the Golden Triangle which is filled with a large array of shops. The Petronas Twin Towers are also an easy walk from the hotel. There are many facilities available at the hotel including numerous restaurants and bars, an outdoor swimming pool and tennis court, WiFi internet plus much more. This Kuala Lumpur accommodation offers the perfect location for those travelling to the area for business, stopover or holiday. Sheraton Imperial Kuala Lumpur Hotel is a luxury five star resort set within the Golden Triangle of downtown Kuala Lumpur and offers a wide range of business and recreational facilities. The rooms and suites are large and boast great views over the city with some rooms overlooking the Petronas Twin Towers. Offering 4 star accommodation in the city centre, Swiss Garden Hotel Kuala Lumpur brings together the bustle of a modern city with the rich culture and heritage of Malaysia. Within walking distance of a range of popular attractions, the hotel is surrounded by a variety of shopping and dining options as well as the famous Petronas Twin Towers, Times Square, Chinatown, Bintang Walk, Pavilion KL, Low Yat Plaza, Merdeka Square and more. Luxury five star rooms and facilities can be found at The Westin Kuala Lumpur which is set in the centre of the Golden Triangle. Business travellers, couples and families can take advantage of the great location with many attractions, shops, restaurants and businesses nearby to this Kuala Lumpur accommodation. Kids can enjoy the Westin Kids Club while the adults can relax by the outdoor swimming pool or touch up on their fitness at the gym. Conveniently located in the centre of the city, Traders Hotel Kuala Lumpur by Shangri-La boasts a luxurious range of rooms and suites set directly opposite the iconic Petronas Twin Towers. Enjoying a full range of onsite services and facilities, all accommodation features panoramic views of the city skyline while club rooms and suites enjoy a deluxe range of privileges at the Traders Club Lounge. Villa Samadhi Kuala Lumpur is a private oasis ideal for couples enjoying a getaway to Kuala Lumpur for shopping and touring, as it welcomes guests aged 12 years and over. This Kuala Lumpur accommodation is located in a quiet street just 10 minutes from the city centre. With just 21 villas surrounding a central lagoon pool and gardens guests are assured a peaceful sanctuary in this luxury villa retreat in the heart of the city of Kuala Lumpur. Enjoy boutique accommodation and luxury resorts of international standard located right in the heart of this cosmopolitan city, surrounded by shopping, attractions, public transport and fine dining.